Metalysis, the Rotherham-based innovator, is playing a key role in helping Britain's Armed Forces to save time and money in their use of titanium in important defence applications. Backed by investors and grants the Cambridge University spin out has secured over £30m of investment and opened a Materials Discovery Centre in a 22,000 sq ft unit on the Advanced Manufacturing Park (AMP), also in Rotherham. It is also scaling up production of titanium at its Farfield Park premises. The MoD's Defence Science and Technology Laboratory (Dstl) in Porton Down has revolutionised the production of titanium by reducing the 40 stage process down to just two steps and potentially halving the cost. It is based on the FASTForge project being carried out at the University of Sheffield which relies on Metalysis technology. The current $10 billion titanium market size is constrained by the cost of the metal and is poised to expand rapidly if the cost can be lowered. Titanium is as strong as steel and half the weight - but around ten times the cost. Defence Secretary Gavin Williamson said: "Our Armed Forces use titanium in everything from cutting-edge nuclear submarines and fighter jets through to life-changing replacement limbs - but production time and costs mean we haven't always used it. This ground-breaking method is not only faster and cheaper but could see a huge expansion of titanium parts and equipment throughout the military. It is a clear example of how our world-class scientists are working behind the scenes to help our Armed Forces as well as bringing prosperity and security to Britain." Titanium's high strength, light weight and corrosion resistance sees it widely used in defence, in military aircraft and submarines, but its high production costs make it difficult to justify in all but essential areas. Dstl has invested almost £30,000 in the new research project at the University of Sheffield, which led to the development of the new ground-breaking manufacturing process. 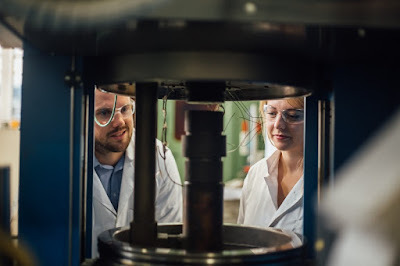 Dr Nick Weston, research associate at the University of Sheffield, said: "FAST-forge is a disruptive technology that enables near net shape components to be produced from powder or particulate in two simple processing steps. Such components have mechanical properties equivalent to forged product. For titanium alloys, FAST-forge will provide a step change in the cost of components, allowing use in automotive applications in automotive applications such as powertrain and suspension systems." Funded by Innovate UK, the university is working with Metalysis, the Dstl, the Advanced Forming Research Centre (AFRC) and Safran Landing Systems. In the laboratory, Field Assisted Sintering Technology (FAST) or Spark Plasma Sintering (SPS) exploits the Metalysis process and has been used to produce a shaped preform billet that is finished to near net shape using a one-step forging operation.